Travel down the ancient river to a land of unforetold treasures. Click here to play! The Pharaoh has given you this task of utmost importance; will you succeed in earning your riches? 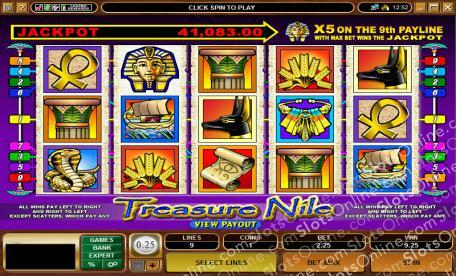 Treasure Nile is a riveting 5-reel game that is played across 9 pay lines, with the more pay lines activated increasing your cash payouts on winning combinations! This progressive is for real cash play only, and will payout tens of thousands of dollars if you manage to hit the jackpot. The Pyramids symbol is Wild and can be substituted for any other symbol except Scatters and Progressive Pharaohs. The Scarab is Scattered can not only earn you up to 50 times your bet, but can also multiply your payouts when used in a winning combination. The Pharaoh is the most sacred of all symbols, and will pay out up to 6000 times your wager; however, if you find all five on the 9th payline you will win yourself the entire progressive jackpot! The Treasure Nile is waiting for you to discover its riches today! The Scarab is Scattered. It will pay out up to 50 times your bet as well as multiplying payouts when used in a winning combination. The Pyramids symbol is Wild, and can be substituted for any other symbol on the reels except Scatters and Progressive Pharaohs.